I have some friends who get frustrated whenever they cook ribeye meat on the grill. What do they complain about? Well, they say that their dishes don’t taste or look like the ones served in restaurants. And I tell that’s not a problem at all. Chefs have exhausted a lot of years just to learn and perfect the art of cooking ribeye steak (among many other dishes) on the grill and there’s no reason to compare. Now I’m not saying that we have to enroll in a culinary school just to be able to serve home-cooked goodness such as theirs. There are definitely ways on how we can better our cooking. For starters, check out these simple tips! 1. 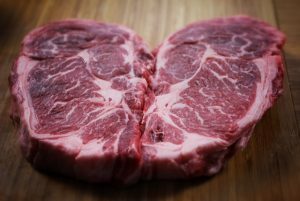 Buy steaks that are about 1.5 to 2 inches thick. I know this is not readily available in groceries because the ones being sold are either too thin or too thick. Don’t worry though because you may actually ask the butcher to have yours customized. 2. There are a lot of things that some of us apply on our steak. I suggest just going with the good old salt and pepper. You can always brush your steak with sauce a minute before it’s cooked. Just remember to apply your salt and pepper generously at least 40 minutes prior to cooking it on the grill. 3. When cooking ribeye steak on regular grills, experts recommend flipping the meat regularly (but not too much) to help the temperature work its magic and cook the meat evenly. However, if you’re using a grill with a lid, you can simply leave it covered and let the meat cook for an hour. Once that amount of time has passed, you can lift the lid up and flip your meat. 4. Searing your meat is a wonderful idea. You may use canola oil or also blend it with olive oil for additional flavor. Brush some oil on your steak to let it sear while cooking. This way, the end product will show a scorched coating and a nice medium-rare, pink inside. 6. To give your meat beautiful grill marks, simply lift them up and turn them 45 degrees sideways. That should give them charred marks for gorgeous plating. 7. There’s no need to tent your steak. Tenting is a process wherein food items are covered with foil to reflect heat and avoid overcooking. Simply move your meat to a cooler side on your grill or transfer them to a trenched cutting board or a serving plate. 8. Don’t make your guests eat steak that has just been removed from the grill. That’s really too hot. Let your meat cool down for 10 minutes. During this time, you can cook your veggies and corn on the grill. I hope that you find my tips really valuable. If you want to serve the most delectable barbecue dishes, only use the best barbecue grill in town. Get yours now from La Caja China!